Sheffield Take Over the Wardrobe! On Saturday, I followed my friends Hot Diamond Aces up to Leeds, to play a gig at the funky Wardrobe venue – where I’ve previously seen Seun Kuti, so they were definitely amongst good company. The Wardrobe is a great venue – with a large bar/restaurant at street level, very close to Leeds Playhouse (in fact, The Wardrobe used to be its costume department), and a spacious basement venue downstairs. The whole ethos is around great music, so everyone there is going to be a big music fan, or a musician themselves. Apart from the first band on, who were from Leeds, it was a night where Sheffield got to show its big neighbour up the road what it’s made of! Apparently, this was only Tough Crowd‘s second time playing live together. 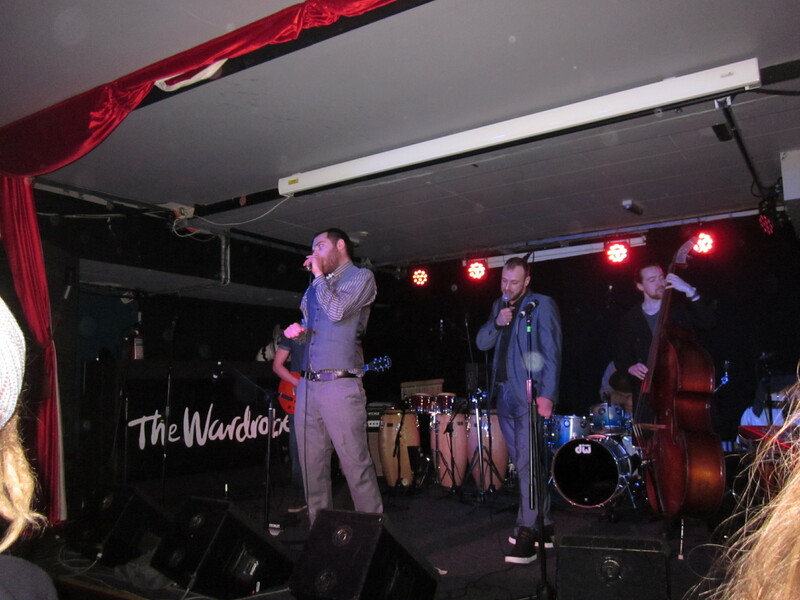 They were great – two suited and booted MCs rapping about being polite and considerate, with an accomplished jazz/funk backing from seasoned musicians. The lyrics were funny and engaging and the music was an antidote to hip hop with backing tracks. I think we’ll definitely be hearing more from them in the future. Tough Crowd – playing to quite a nice crowd in Leeds! By the time I’d bought myself another drink, there was no room to get onto the dance floor for Hot Diamond Aces. Luckily, there was lots of space at the side of the stage, raised up well so that I got a good view. I was glad to be there, as I could see the crowd dancing, throwing jazz shapes (yes, really!) and enjoying themselves as they heard the funky tunes of Hot Diamond Aces for the first time. 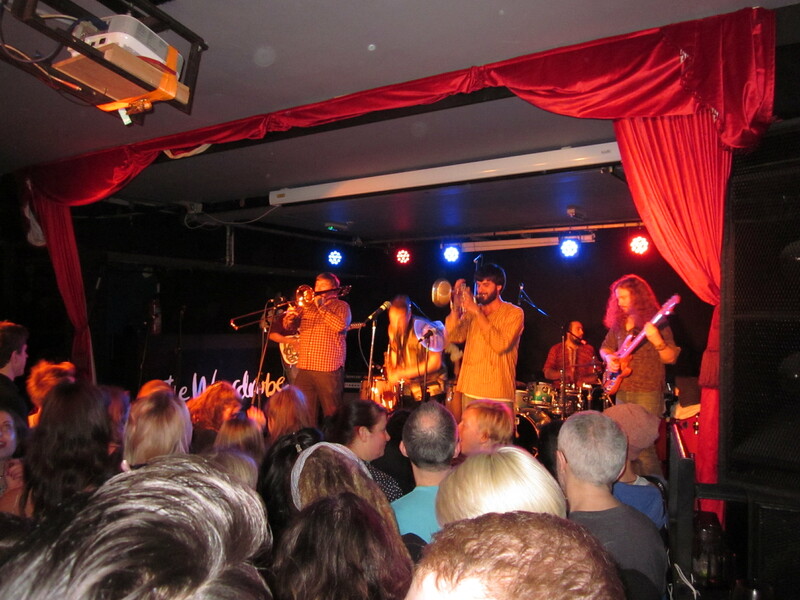 Combining funk, jazz, afrobeat, and big beefy tunes, they really made a big first impression on the people of Leeds. Hot Diamond Aces wow the Wardrobe! For the last song, my friend Angelina came on to dance. Her energy and passion totally blew everyone away. 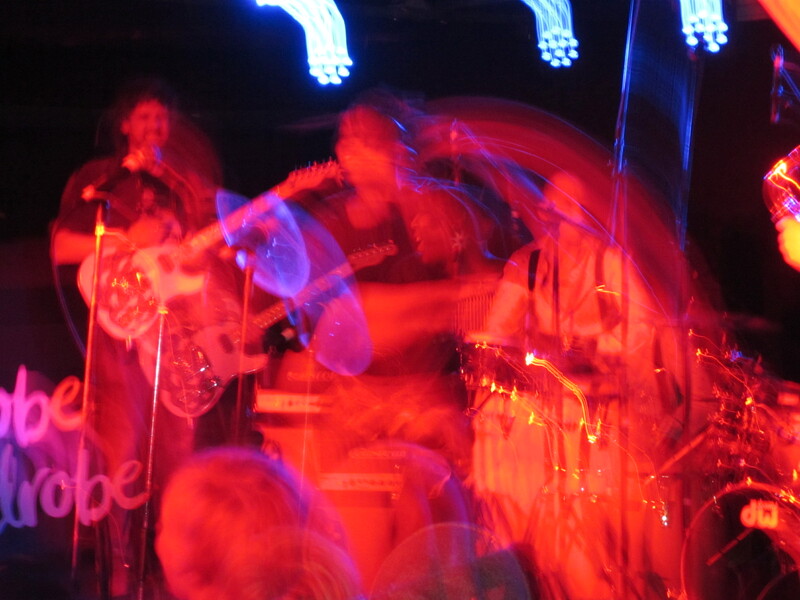 This photo didn’t quite come out as planned, but I think it’s brilliant – very psychedelic! As you can see, Angelina was moving so fast that there are two of her – and two of Dan’s guitar! Finally, The Renegade Brass Band showcased their 8-horn hip hop sound. Featuring James from Hot Diamond Aces on trumpet (he was exhausted, doing two gigs on the trot, but didn’t show it! 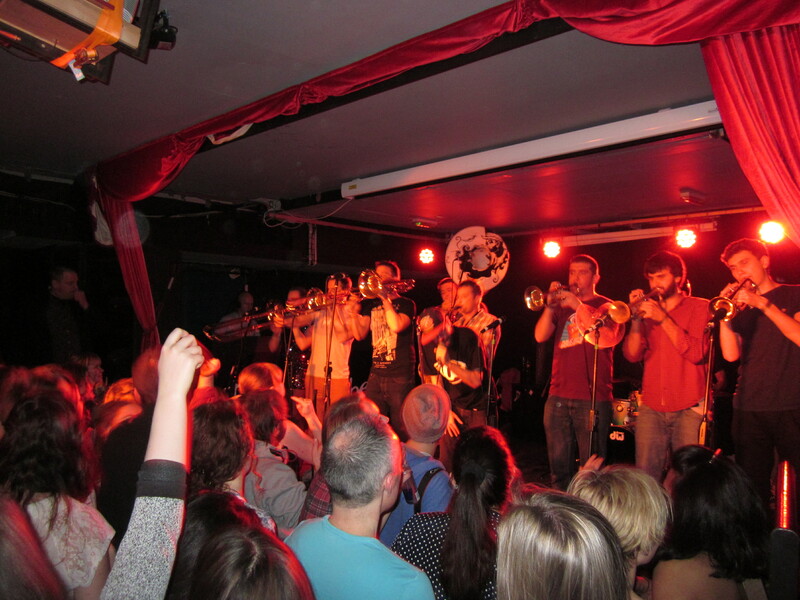 ), the Renegade Brass band deliver tunes in a way that’s as bold and brassy as their name suggests, with a great MC who really knows how to work a crowd! Craig Charles has recently called them “probably the best brass band working out of Britain”, and they’re, quite rightly, one of Sheffield’s most hotly tipped bands at the moment. They’ve come a long way in the five years since I first saw them, at Bearded Theory festival in 2010, playing mid-afternoon on the Baar stage! The Renegade Brass Band – a wall of brass! Seeing a night of first-class home-grown live music at the Wardrobe was a great way to start celebrating my birthday, and well worth a trip up the M1! I’ve got plenty of live music treats to come, so I’ll keep you updated with lots of short posts!